Once covered with bright orange and sunshine-yellow walls, the interior of this small, family-owned Korean restaurant in Allston used to look like a child’s playroom. But in less than a year, Color Restaurant on Harvard Avenue has transformed from a cutesy food shop to a rustic and refined restaurant. This new sense of sophistication shows in the small potted plants on the windowsill and the custom-made, faded wooden tables.The once playful walls now showcase photographs of food along with shelves displaying different intricate glassware. Each of these simple elements create a homey feel within the restaurant. 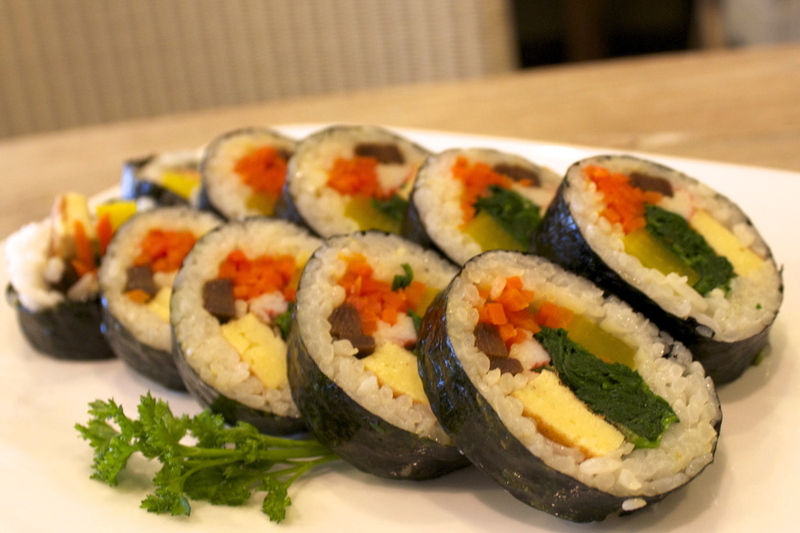 Color Restaurant’s menu has a wide variety of Korean fast-food staples such as Bibibam (mixed vegetable and rice in a stone-pot), Pajeon (scallion pancakes filled with kimchi or seafood), Kalbi (sweet marinated beef short-rib), and Kimbap (Korean sushi). My personal favorite dish on the menu is their Kimchi Bulgogi Fried Rice. The dish consists of thinly sliced rib-eye beef, kimchi, (spicy fermented cabbage) and fried rice with a sunny-side up egg on top. The dish has a bit of heat, which is intensified by the kimchi, but it is not enough to overpower the sweet and savory flavors of the beef. In the next month, Color will be undergoing a few more transformations including the change of their name to Bibim. In Korean, bibim means “mixed”. Their new identity will be reflected in the Korean-American inspired dishes that will be featured in the restaurant’s new menu. One of the dishes that will be featured on the new Bibim menu is Kalbi Steak, a Korean take on a classic American dish. Although toned down in décor, Color is still serving vibrant and inspiring dishes, as they always have.With a more relaxed atmosphere, I found it easier to enjoy my meal and focus on the tasty food.